These yeast rolls are the best! Remember back in elementary school when the rolls were huge and sweet? This is the ones! They are so easy and even easier if you have a bread machine to do the kneading for you. Place all ingredients in bread pan in the order listed. Select dough cycle. When cycle is finished, grease cookie sheet. Divide dough into 12 pieces. Shape each piece into ball. Place 2 inches apart on cookie sheet. Brushes with melted butter, if desired. Cover with clean cloth; let rise 30-40 minutes or until double. ** Heat oven to 375. Bake 12-15 minutes or until golden brown. Brush tops with melted butter again, if desired. **My bread machine has a rising cycle built in so if I'm strapped for time, there's no need for this step of extra rising. I just divide the dough, brush with butter and bake! They are so wonderful! If you try them, let me know how you like them. 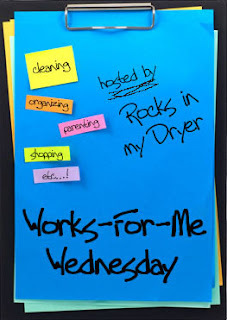 Visit Shannon over at Rocks in My Dryer for more Works for Me tips!